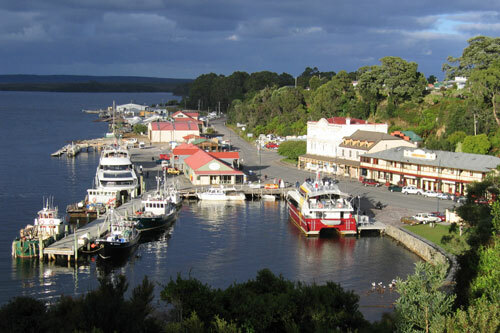 Strahan Tasmania ,which includes Macquarie Harbour, Sarah Island and the Gordon River cruise,can be described as one of the most unique places in Southern Australia. Strahan is located on a spectacularly beautiful harbour at the end of the world. Located 298 km west of Hobart and 41 km from Queenstown, Strahan Tasmania lies on the edge of the unspoiled beauty of Macquarie Harbour. It is the last outpost of civilisation on the West Coast of Tasmania and is surely one of the loneliest places on earth. Take in the Wilderness - Strahan Tasmania is a must visit Tasmanian Experience Destination. Perhaps the most famous activity is the Gordon River Cruise that takes in Macquarie Habour and the Lower Gordon River. This is a unmissable cruise in Good or Bad weather. Strahan Tasmania is a lovely location with stunning walks and close to many fine beaches.